Yesterday, I vasectomized a peacock. The procedure itself was straightforward, but it was all of the discussion that followed that prompted me to write. In fact, a lot of the comments and questions were ones that I had heard before. So I thought I would take advantage of the time to discuss bird castration and vasectomy. Vasectomy is simply cutting the ductus deferens which is a long tube leading from the testicle (deep within the abdomen or ‘coelom’) to the cloaca. This is the conduit for sperm to travel from the testes to the outside world. The ductus deferens is cut and a section removed preventing future inseminations. This can be done via endoscopy (mildly invasive), open coelomic surgery (most invasive) or in small songbirds (like finches) at the protrusion of the cloaca (minimally invasive). In order for vasectomy to be effective, both vas deferens must be completely transected. Depending on the species, some birds can still effectively inseminate females for up to 6 months after vasectomy. This occurs because sperm may still remain in the vas deferens segment that was not removed. Vasectomy does not affect a bird’s behavior or plumage, just the ability to inseminate (after the tube has been completely emptied). So, this procedure is used mainly as a means of population control. Potential side effects are mostly related to surgery such as anesthetic complications (including death), cutting the wrong structure (such as the ureter and major blood vessels which lie close to the ductus deferens) and incompletely severing the ductus deferens (which may heal and still be functional). Castration is a whole different subject. As a general statement, I do not recommend castration for anything other than testicular disease (mostly cancer). In other words, I do not recommend castration as a means of behavior modification. A bird’s testicles are located deep within the coelom making access difficult and requiring either invasive open body or multiport endoscopic surgery. The technical difficulty of castration in large part depends on the size of the testes (which varies dramatically with breeding season and any disease present). Additionally, seemingly any remnant testicular tissue can regrow. So if a spec of testicle is left (which because of its intimate attachment to surrounding tissues is possible), it can regrow into an active, healthy and very determined organ! Caponization is castration done at a very young age before the testicle has fully developed and enlarged. While I have castrated many birds, some regrettably for behavioral reasons, I now only consider the procedure for medical problems. My experience has been that castration for behavioral modification does not work. This includes attempting to curb aggression in parrots, ducks and poultry and crowing in poultry (chickens and peacocks). The birds temporarily stop their behaviors (probably because the surgery is invasive and they feel rotten) but have all resumed at some point later (some were even checked to make sure there was no remnant regrown testicular tissue). There are actually quite a few studies in various bird species that show the same results- once the behavior is established, castration tends to not make it stop. Some of the studies have even shown increased aggression with castrated birds. Castration would probably be most effective in preventing some behaviors (and normal adult male plumage) when done on young birds. However, I cannot justify the procedure at this time. Part of the problem is that we are asking a bird to not perform a normal behavior such as crowing in roosters and aggressively protecting a mate (which may be a human). So I focus on understanding the behavior and look for other means of modification. Well said, perfectly understandable layman’s language and extremely valuable to know, especially in regard to castration in regard to behavior modification. Thank you for your post! I am a vet nursing student and found this very useful! I have a rescued rooster called Carlos who has become very agressive towards humans. As I am used to rescuing dogs and cats in the main, I asked a college lecturer about neutering him. She said that even if I could find a vet to do it, it probably wouldn’t solve the issue. I have started to try behaviour modification and it seems to have already improved things after just a couple of days. They hens and Carlos have a secure run but I do let them free-range when I am home to keep an eye on them. Now I hand feed carlos treats through the fence so he cannot attack me. He tries to at first, but once he realises I have treats he soon stops. He only attcked me once yesterday, and it wasn’t even a truly enraged attack, if that makes sense. I just picked him up and stroked him and spoke to him, telling him what an idiot he was being. Hi attacks REALLY hurt and do quite a bit of damage. I took him as he was going to be euthanised as he was attacking the small children in his previous home. I am determined to make him understand that I am no threat to him or his wives. worst case scenario is that he never gets to free-range again, and I really don’t want that. He is a year old Bluebell rooster. I am taking some more rescued ex-battery hens soon, and am hoping the arrival of more wives won’t make him even more agressive! By stationing Carlos (meaning you set him in a particular location and feed him treats or regular food) you can often significantly reduce the aggressive episodes. You are essentially beginning this process by giving him treats through the fence. Now train him (targeting) to accept those treats away from the areas where he is aggressive. You can even get him to sit up on a log, fence post, etc where he knows that if he stays there Carlos will get a treat. It sounds like he is food motivated which makes this process much easier! I have 1 male, 1 unrelated female, 1 offspring of the male and 5 pea eggs. I would like to stop after these eggs hatch. Sounds as if vestectomy on the 1 male and however many males out of the 5 eggs is a good idea. Does any one know of a vet in the St Augustine or Jacksonville, Florida area that could do the procedure? 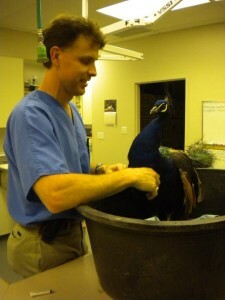 Contact the Association of Avian Veterinarians (www.aav.org) for a list of bird specialists close to you. I have a pair of 2.5 year old peas (male and female), and three one year old peas (one male, two females). All raised from eggs I incubated. The oldest male is aggressive to the point that we have to carry a stick outside to protect ourselves from being attacked. He will attack anyone who comes onto our property. He will follow us around and get behind us and if we aren’t careful, he will attack. I have been kicked down and bloodied a couple of times. He doesn’t seem to pick males more than females. We did not interact much with him as a chick. Didn’t try to tame him; we certainly fed them and cared for them but as soon as they were feathered, they went out to the coop and they are currently free range. We do feed them worms and blueberries from our hands and they will take food from us but they aren’t particularly tame. They are very curious about us and spend a good part of the day watching us through windows and doors. They wander around our 20 acre wooded property and roost about 100 feet up a fir tree that I have placed sheet metal about 4 feet up around the base of to protect from climbing predators. What can we do with this guy? We love him but we can’t live like this. Would caponizing him help this? I have never caponized a male bird before but I can certainly learn and have the appropriate anesthetic, analgesics and instruments to do so. Help! At this point, caponizing will likely not help. In fact, caponizing adult birds may make them more aggressive (once they recover from the surgery). This is more a behavior management problem. Peacocks usually respond to positive reinforcement training this includes stationing, food directed behaviors, etc. I would recommend working with an animal behaviorist. We have done similar techniques with ‘obnoxious’ turkeys and chickens. Thank you for the information. ….Long story short, I have a maybe 7-month-old cockerel who, we thought was our 3-year-old hen that we’d put on a farm for 18 months while we were out of the country. I’m guessing he’s her son (appearance and behavior), and maybe she is dead. While I try to find my hen, if she is still alive, I have the problem of a newly crowing young rooster inside the town limits where roosters are illegal. I agree with everything everyone has said about castration being a horrible idea, but the other option seems to be killing him. I’m going to try a deslorelin implant if I can talk my husband into the expense and the city into letting me keep him long enough to try it. That’s not a long term solution though, even if it works, because we can’t afford to do it repeatedly. So far I can’t find anyone who is willing or able to rehome him. Does anyone have any other ideas? How risky is castration if a knowledgeable, experienced avian vet does it? I read it used to be done without anesthetic, which I WOULD NOT do (that’s horrific). Is euthanasia really better?? Anyway, I loved his mother, and he’s her spitting image (except his new saddle and tail feathers that are growing in now! )… I’m not sure how I could bear killing him. What can I do? The issue is not the danger involved with castrating birds. In fact we perform these procedures with some regularity as a treatment for medically non-responsive testicular tumors. The issue is that castration rarely (never in my experience) resolves the crowing behavior in roosters. That is unless the bird is caponized (castrated when very young prior to development of these behaviors). For adult roosters that are already crowing, castration does temporarily stop the crowing behavior (usually for a few weeks). I believe they temporarily stop crowing because they are recovering from surgery and are either in pain or uncomfortable (we are still learning how best to manage pain in birds). However once fully recovered from surgery, the crowing behavior usually returns. The challenge is that you are going against a programmed behavior and once it starts it is difficult to stop. You can try ‘light neutering’ your rooster. This works best with drakes (ducks) displaying obnoxious male behaviors. You are essentially shortening and shifting the visible day length by placing the rooster in a dark room over night and letting him outside later in the morning (rather than the crack of dawn). In this example, you put the rooster ‘to bed’ in a dark room at night and then let him out later in the morning (9 AM for example). This does not always work, however it is a better alternative to euthanasia.